100 Employee self-totaling time clock. Drop it in, automatically aligns the card. 100 employee capacity. 100 Employee self totaling time clock. Prints red for late in-punches. Totals for each day, week and even two-week pay periods. Includes free full power operational battery. Quality you can see. 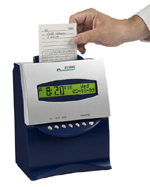 Easy to set-up 50 employee self totaling time clock. Amano MRX35. Weekly, bi-weekly machine that calculates daily and/or weekly overtime. All Metal. The MOST RUGGED self-totaling time clock ever made. Can also ring shop bells. We are a REPAIR SHOP, too! Includes lifetime free technical support. When you must have a clock THAT WILL NOT BREAK, THIS IS IT. 250 employee capacity, in-punch lock-out, rounding, auto lunch deduction, Lifetime tech support. Ships in 24 hours. Compumatic XL1000 Time Clock package includes 100 free time cards, unlimited tech support and One Year Machine Warranty! 100 employee capacity. FACTORY FRESH, NEW. 100 Employee Self Totaling Clock. Uses the same cards as the Lathem 7000E Excellent for weekly payroll. Out of production. Supplies are still available. Check out our broad selection of excellent self-totalling time clocks. Fast shipping!